It’s good to see data backing up things you know are true from an anecdotal perspective. Recent data from Black Book Research reveals that younger healthcare consumers prefer healthcare organizations that have greater technology capabilities. These respondents don’t want to engage hospitals and other healthcare providers in a traditional face-to-face way and often prefer digital interaction. This parallels the rise in social media usage as well as what I observe in the real world. On a recent trip with a youth group, I watched a crew of teens stand around texting each other rather than having an actual conversation. I’m not in the under-40 crowd that was mentioned in the survey, but I know that I prefer online bill pay and online scheduling to sitting on the phone trying to take care of things, or having to write a check or send my credit card information through the mail. The piece goes on to note that hospitals still aren’t putting budget or priority behind patient engagement or interoperability as well as they could. Revenue cycle issues such as billing or payment continue to represent a low-point in the patient experience. After dealing with the bills related to a surgery last year, I would agree. Interoperability is still a barrier, whether you’re talking about hospitals or ambulatory practices. I had a recent cringe-worthy experience trying to track down some lab results from a practice that claims to have a patient portal but that in reality has failed to configure it so that patients can View/Download/Transmit or even see their CCDA. They don’t have online scheduling but do have online bill pay, but I haven’t been able to test drive it since they haven’t sent my claim to insurance yet, even though the visit was more than 30 days ago. That shows that they have opportunity for improvement in ways other than communication, and if I have to go back I’m going to be tempted to offer them my business card – especially since I know they attested for various incentives and lacking VDT capability is a big red flag. 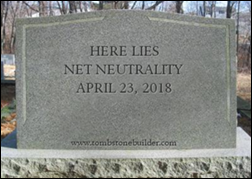 The Net Neutrality repeal went into effect this week, even as members of the House Energy & Commerce Subcommittee on Communications and Technology debated so-called “paid prioritization” where Internet providers can charge higher fees to allow certain content to move faster. Paid prioritization was compared to TSA PreCheck, allowing better access for those who can afford it. Informatics advocacy organization AMIA submitted comments suggesting that Congress should thoroughly evaluate the issues and consider situations where prioritization might benefit the common good, such as telehealth service traffic. AMIA encouraged the subcommittee to think about broadband access as a social determinant of health, providing examples of mental health services in rural areas and noting that healthcare is increasingly delivered outside the walls of hospitals and healthcare facilities. So far, I haven’t noticed any appreciable slowness for any sites except LinkedIn, which is always a little squirrely anyway. There has been a fair amount of anxiety in the physician lounge as practices await their first encounters with the long-awaited new Medicare card. 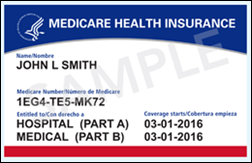 As seniors become eligible for Medicare, they will be issued the new cards, although existing beneficiaries may not receive their cards for months depending on what state they are in. The CMS website lists a wave deployment for the new cards, with 13 states and territories scheduled to receive their cards in May, and with everyone else listed as “After June 2018.” It boggles the mind to think that despite knowing how many beneficiaries are out there and how many cards can be produced in a given length of time, that they can’t be more specific than that. Practices that see a large volume of Medicare patients would be wise to try to update information while scheduling appointments and during telephone encounters so that they don’t bottleneck at the front desk once the new cards are widely distributed in their state. Watch out for patients with the old Medicare card who might have read this article that recommends they don’t carry their card and instead carry a photocopy with the numbers blacked out. It suggests that patients should tell medical providers their SSN/Medicare Number verbally for a visit. That will go over like a lead balloon at most medical offices, and I can only imagine the denials from number transposition or other errors. The Leapfrog Group released its Spring 2018 Hospital Safety Grades, scoring approximately 2,500 facilities across the country from A to F. Five formerly failing facilities made it to grade A this time, with a total of 46 hospitals earning an A for the first time. My favorite academic medical centers scored a B and C, while small community hospitals that handle few complex cases scored As. Although I appreciate the need to try to report data in a meaningful way, as a patient I would choose the academic medical center regardless of score in the event I needed a complex procedure. CMS is again trying to make us crazy, with the recent release of nearly 1,900 pages of fun hidden in the guise of its Inpatient Proposed Rule for Fiscal Year 2019. I do like the idea that CMS wants hospitals to publish their charge masters on the Internet, but the charge master is less relevant than knowing what the range of accepted payments is on those charges. CMS has requested public comment on the latter, so it might be forthcoming as well. Whenever I have to transfer self-pay patients from our very cost-effective urgent care to the nebulous costs of the hospital, I always have the conversation with them about saying up front that they are self-pay and asking if there is a discount for paying promptly in cash. Especially with younger patients, they don’t know they could end up with collections agencies hounding them, bad credit, or even a medical bankruptcy. Although there’s an increase in the overall inpatient payment rate, higher numbers of uninsured patients will lead to more delivery of uncompensated care. I’m a big fan of the proposal to eliminate duplicate measures across Pay for Performance and Inpatient Quality Reporting programs, as well as the elimination of reporting for measures identified as “topped out.” Even with high scores, generating, parsing, and distributing reports is a pain for technology and operations support teams. There’s always at least one provider who thinks he should have had 100 percent rather than a meager 98 percent, and demands a chart review to prove his point. The comment period is open through June 25 with an expected final rule due sometime around August 1, although we know those release dates can be fluid. Have you read the 1,882 pages yet, or are you just waiting for the movie? Leave a comment or email me.